Compared with the labor force of past decades, today's labor force is older, more racially and ethnically diverse, and composed of more women. These trends are expected to continue to shape the future of the workforce, but the U.S. labor force is expected to grow at a slightly slower rate than in previous decades. The annual growth rate of the U.S. labor force over the 2010–2020 period is projected to be 0.7 percent, lower than the 0.8-percent growth rate exhibited in the previous decade. The diversity of the labor force has increased in the past several decades. Over the next decade, the labor force will become even more racially and ethnically diverse. The share of Hispanics or Latinos and Asians will expand more than ever before because immigration is the main engine of population growth and because Hispanics or Latinos and Asians have high labor force participation rates. A combination of rapid population growth (from high birth and immigration rates) and high participation rates results in high Hispanic or Latino labor force growth. In 1990, Hispanics or Latinos composed 8.5 percent of the labor force, a share that increased to 11.7 percent in 2000 and 14.8 percent in 2010. BLS expects that Hispanics or Latinos will make up 18.6 percent of the labor force in 2020. The Asian labor force also is projected to increase substantially over the next decade. Asians accounted for 3.7 percent of the labor force in 1990 and 4.7 percent in 2010. Asians are projected to increase their share of the labor force to 5.7 percent in 2020. The Black or African American labor force is projected to grow steadily but at a slower rate than that of Hispanics or Latinos and Asians. Blacks or African Americans accounted for 10.9 percent of the labor force in 1990 and 11.6 percent in 2010; they are expected to increase their share to 12.0 percent in 2020. 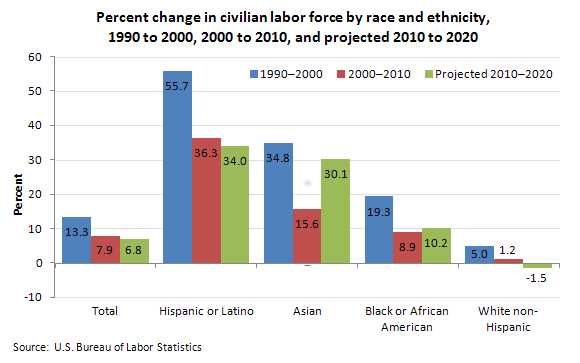 The White non-Hispanic labor force is projected to decline over the 2010–2020 timeframe. The share of the White non-Hispanic labor force decreased from 77.7 percent in 1990 to 72.0 percent in 2000 and to 67.5 percent in 2010. BLS projects that this group will compose 62.3 percent of the labor force in 2020. These projections are from the Employment Projections program. To learn more, see "Labor force projections to 2020: a more slowly growing workforce," by Mitra Toossi, Monthly Labor Review, January 2012. Bureau of Labor Statistics, U.S. Department of Labor, The Economics Daily, Labor Force Projections to 2020 on the Internet at https://www.bls.gov/opub/ted/2012/ted_20120216.htm (visited April 21, 2019).